The form is inspired by the date palm – a symbol deeply entrenched in the Arabian culture. The towers are symmetrically placed on the 7-storey high podium to get the best views of the Burj Khalifa, Business Bay and the sea. The podium houses all the public areas, restaurants, banquet hall and the essential back of house areas. The grand entrance lobby is 4 floors high and overlooks the Business Bay. The 1000-capacity banquet hall has an independent access for smooth functioning. The podium terrace has one of the largest spas in Dubai and is beautifully landscaped with gardens and swimming pool. This project, owned by The Emirates Group, was originally conceived as a single, 350 m (1,150 ft), 77-storey tower intended to be completed in 2008 and built alongside the Sheikh Zayed Road. However, its design and location had to be changed because of the construction of a creek extension belonging to the “Business Bay megaproject”. The new twin-tower design was launched at the Arabian Travel Market in Dubai in 2006 with 395 m (1,296 ft) towers. However, the shape of the towers was modified and the height decreased to 355 m (1,165 ft) in a later redesign. The concrete structural frames of both towers topped out in April 2010. As of April 2011 the spires on both towers have been added while the outer structure of the both towers has almost been completed. 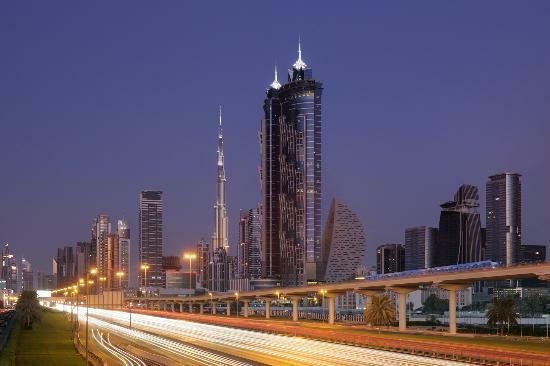 The buildings were completed in 2012, surpassing the Rose Rayhaan by Rotanaas the world’s tallest hotel.